When you have a very famous father, like mine, everyone thinks they know him. My Dad, Larry Hagman, portrayed the storied, ruthless oilman JR on the TV series Dallas. He was the man everyone loved to hate, but he had a personal reputation of being a nice guy who fully subscribed to his motto: Have Fun, Don't Worry, Be Happy. Dad had a famous parent too, Mary Martin, known from many roles on Broadway, most memorably as Peter Pan. Off-stage she was a kind, elegant woman, who maintained the down home charm of her Texas roots. Both were performers to the core of their beings, masters at crafting their public images. They were beloved. And their relationship was complex and often fraught. My father never apologized for anything, even when he was wrong. But in the hours before he died, when I was alone with him in his hospital room, he begged for forgiveness. In his delirium he could not tell me what troubled him but somehow I found the words to comfort him. After he died I was compelled to learn why he felt the need to be forgiven. As I solved the troubling mystery of why my happy-go-lucky, pot-smoking, LSD-taking Dad had spent his last breaths begging to be forgiven, I also came to know my father and grandmother better than I had known them in life. KRISTINA HAGMAN is an artist who has been featured in the Los Angeles Times, USA Today, People magazine, Closer magazine, and more. 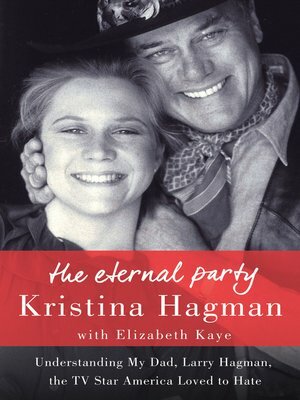 The daughter of Larry Hagman and granddaughter of Mary Martin, she lives in Santa Monica, California.